Drumnadrochit lies at the head of Urquhart Bay on Loch Ness and is the focal point for interest in the Loch Ness Monster: but don't let that put you off. It can seem a little crowded and commercialised as you drive through, but scratch the surface and you'll find yourself pleasantly surprised by an unexpectedly attractive village. Turning to Nessie first, this is a creature which may or may not actually exist. Either way it has been exercising a fascination since 22 July 1933, when George Spicer and his wife, visitors from London, saw "a most extraordinary form of animal" cross the road in front of their car and enter Loch Ness. Other sightings were soon reported and the cult of the Loch Ness Monster quickly took off. It has since been suggested that the first reference to it in print was in the biography of St Columba, written in the late 600s. Whether Nessie exists or not is open to debate, but if it does, it is reputed to have a near relative, Morag, who is said to live in Loch Morar. Drumnadrochit is certainly the place to get to know Nessie better. Overlooking the main junction in the centre of Drumnadrochit is Nessieland, where you can find out more about the monster. 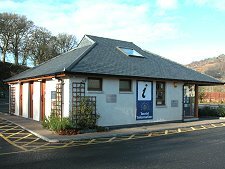 A short distance further from the centre of the village is the Loch Ness Centre and Exhibition. This excellent visitor attraction gives visitors the information they need to make up their minds for themselves about Nessie, as they move through a series of highly informative audio visual displays. 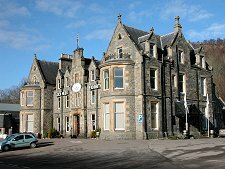 The Loch Ness Centre and Exhibition is housed in the imposing stone building that used to form the main part of the Drumnadrochit Hotel. 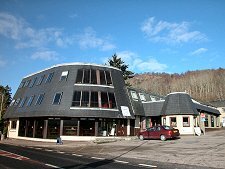 The hotel is now housed in the attractive modern extension built in 1986. 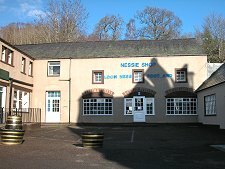 Proceeding through the gap between the exhibition and the hotel brings you to the Nessie Shop and the Whisky Shop. What you might expect to be highly commercialised development turns out to be pleasant conversions of older buildings. 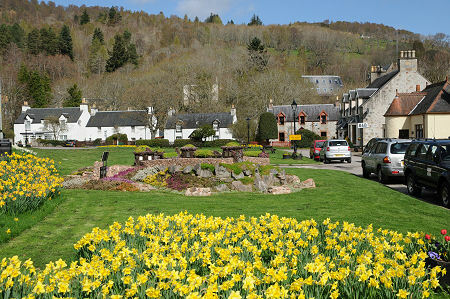 At the heart of Drumnadrochit is its a village green, which is turned yellow by daffodils in spring. Here you can find a stunning model formed by miniature hedges and plants of Urquhart Castle. Surrounding the village green is a collection of largely white-harled buildings which between them form the core of the village. Fiddler's carries signs proclaiming its status as a leading Malt Whisky Bar, while Paterson's, on the far side of the main road, is an attractive grocer, newsagent and post office. To the south of the green is the village's main car park, complete with the Tourist Information Centre. Further south still, Drumnadrochit becomes Lewiston, a planned village created in 1769. Not far beyond Lewiston you should watch out for the turning to the car park for Urquhart Castle, a large and fascinating castle with an excellent visitor centre and even better views over Loch Ness. A visit to Urquhart Castle is an essential part of any tour of Loch Ness. 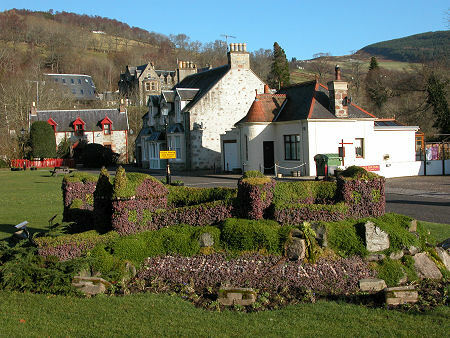 Drumnadrochit is on the route of the Great Glen Way, the 73 mile long distance path from Fort William to Inverness. The result is the arrival in the village of a steady stream of footweary travellers in search of food and accommodation.